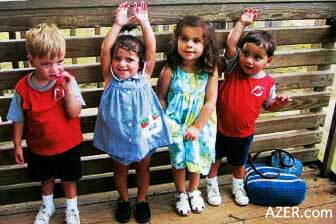 Azerbaijani Adoptees-First-Ever Reunion in the U.S.
Left: These four children enjoyed a day with their families at the first reunion picnic for adoptees from Azerbaijan. From left to right: Daniel Simone, Gabrielle Barnard, Inara Abernathy and Paul Simone. 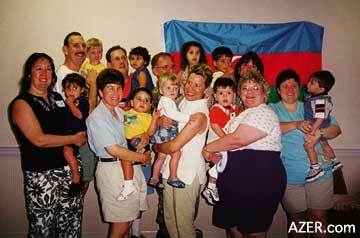 More than 60 people representing eight families attended the first-ever Azerbaijan Adoption picnic, held July 13, 2002 in Nashville, Tennessee. This event was a reunion for the families who have adopted children from Azerbaijan during the past two years. The nine adoptees who attended were: Inara Abernathy, Gabrielle Barnard, Matthew Bergman, Talia Blum, Grayson Huffman, Dale Papp, Sabina Shifrin and Daniel and Paul Simone. Their families are widespread throughout the United States - specifically Tennessee, North Carolina, Florida, Missouri, Illinois, New Jersey, Alabama and Mississippi. "The children were obviously the highlight of the day," says Kimi Abernathy, Inara's mother, who helped to organize the event. "They were all healthy, happy and beautiful. They played with one another and seemed to have an intuitive connection. Though the children don't remember one another, we parents remember seeing them in the orphanages or on videos. It was amazing to see how far they've come. While strangers often comment on how lucky our children are to have been adopted, we know that in reality these children are much more of a blessing to us - their parents and families. This picnic reminded each of us how much we owe Azerbaijan by allowing us to build our families by loving these children." Right: Nine Azerbaijani Adopees and thier families met for a reunion this past July in Nashville, Tenessee. One of the reasons the parents organized the reunion was to give their children the opportunity to stay in touch. "It's wonderful that these children who share a common bond are able to grow up together," says Michelle Blum. "The combining of cultures-their Azerbaijani heritage along with their American heritage - is something that should be cultivated. It has been a great gift and honor to be the parent of such a beautiful Azerbaijani child. Talia will always be our little girl, and she will always be an American citizen, but a part of her will also always be Azerbaijani, as it should be." Kimi and the other parents plan to make the reunion an annual event in order to build relationships between the families. "I was deeply touched by how much everyone treated each other like 'old friends,'" says Grace Barnard, another one of the parents who helped to plan the event. "It was very obvious to me that many of the people intended to stay in touch and make the reunion a priority for their children." The parents also expressed deep concern for the Azerbaijani children who remain in orphanages. "I don't think it's possible to see the children in the orphanages without wanting to help them," Kimi says. "We want them to be fed, loved and cared for, too." According to Gwen Burchell from United Aid for Azerbaijan, the desperate situation now found in Azerbaijani orphanages is not improving. In fact, the number of children being abandoned each year continues to grow. In terms of care giving and nutrition, Baby House No. 1 - the orphanage from which most children are adopted - has the highest standards. During the picnic, the families pooled together a $500 donation to help the orphanage. International adoption does not completely fix the problem of abandoned children, but it does provide loving homes for a few of them. "We need to work together to try to effect system-wide change," Kimi says. "It's important to work to eradicate the reasons families give up their children in the first place. The Azerbaijani government in turn needs to create social policies that will support children and their families." All of the families who attended the adoption reunion this past July keep in contact through the AzerbaijanAdopt ListServ, a valuable resource for information, support and friendship. Plans are being made to hold a second reunion next summer. Discussion is underway to pick the best location for the most families - such as Kansas City or Chicago. Already, many other families have indicated that they want to attend. To join the ListServ go to YAHOO.com/group/azerbaijanadopt.